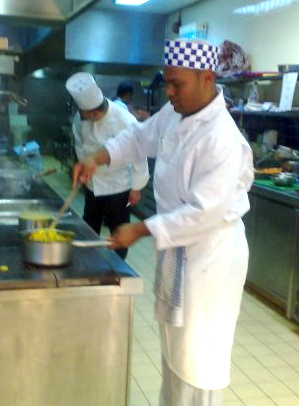 The fascination of cooking, took him on his journey through major cities to work alongside many high profile and household names all over Bangladesh, he has enhanced his array of culinary skills further by taking charge of kitchens in various top hotels in Bangladesh such as Radisson and West Inn International to name a few. Arriving in England Mr Chowdhury was immediately headhunted and took charge of many Indian restaurants, stretching from the North to the South of England. Currently at the The Shad, Mr Chowdhury is continuously developing new dishes unique to The Shad, from vegetarian to fish and various other meat dishes for which he is renowned for. We invite you to come and dine at The Shad and savoir some of his delights. Q: Who is the best cook, you or your wife? A: Of course it’s me, I hope she doesn’t read this!!! Q: Do you ever go out for an English? A: Absolutely i go out for an English. My favourit is the Sheppards Pie, but i grew up with spicy food so i created my own version of the Indian Sheppards Pie. Q: What is most funniest remark you got for one of your dish? return to work the next day. Apparently he called into to say that its quite difficult to put on his pants with a bag of ice in it.